The 3rd Operations Group is the operational flying component of the United States Air Force 3rd Wing. It is stationed at Elmendorf Air Force Base, Alaska, and is assigned to Pacific Air Forces' Eleventh Air Force. The group is a composite organization that provides air superiority and defense for Alaska flying F-22A Raptor stealth aircraft. In addition, the group supports Pacific Air Forces in the Pacific Command area of responsibility flying C-17 Globemaster III transports and E-3B sentry airborne early warning and control (AWACS) aircraft. The group is a direct successor organization of the 3rd Attack Group, one of the 15 original combat air groups formed by the Army before World War II. It is the oldest active group in the USAF, and the first created after the establishment of the U.S. Air Service. Based in Texas after World War I, the group patrolled the Mexican Border from Brownsville, Texas, to Nogales, Arizona. The group pioneered dive bombing, skip-bombing, and parafrag attacks in the 1920s—the earliest forms of precision guided attack from aircraft—and put this work to good use in World War II. The World War II 3rd Bombardment Group moved to Australia early in 1942 and served primarily in the Southwest Pacific Theater as a light bombardment group assigned to Fifth Air Force. The group participated in numerous campaigns during the war, engaging in combat over Japan; Netherlands East Indies; New Guinea; Bismarck Archipelago; Western Pacific; Leyte; Luzon and the Southern Philippines. On 2 November 1943, the group encountered heavy opposition from Japanese forces at Simpson Harbor, New Britain. In that attack Major Raymond H. Wilkins, commander of the 8th Bombardment Squadron, sank two ships before he was shot down as he deliberately drew the fire of a destroyer so that other planes of his squadron could withdraw safely-an action for which Maj Wilkins was posthumously awarded the Medal of Honor. The 3rd again served in combat during the Korean War, using B-26 Invader light bombers. Captain John S. Walmsley, Jr. was posthumously awarded the Medal of Honor for his actions a night mission. Capt Walmsley discovered and attacked an enemy supply train, and after exhausting his ammunition he flew at low altitude to direct other aircraft to the same objective; the train was destroyed but Walmsley’s plane crashed in the target area. Notable alumni include General Hoyt S. Vandenberg, General Jimmy Doolittle, General Lewis Brereton, General Richard Ellis, General John Henebry, Major Paul I. "Pappy" Gunn, and General Nathan Twining. The 3 OG Mobilizes, deploys, and employs three different squadrons of F-15C/D, F-22, C-17, 2 E-3Bs, and C-12Fs aircraft worldwide to accomplish air superiority, air battle management, air interdiction, counter narcotics, airlift, and air daily air sovereignty missions to achieve dominant maneuver, precision engagement, and information superiority in support of CJCS, PACOM, CENTCOM, SOUTHCOM, and NORAD operations. Curtiss A-12 Shrike Serial 33-229 of the 13th Attack Squadron. Northrup A-17A Serial 36-207 at the National Museum of the United States Air Force. It was assigned to the 90th Attack Squadron (1937–40). It is the only A-17A known to exist. The 3rd Group and its successor units have served the United States on a continuing basis since the group's activation as the Army Surveillance Group on 1 July 1919. [note 3] In August 1919 the Air Service organized its first seven groups and it became the 1st Surveillance Group. Initially the group used Airco DH-4B's to patrol the border from Brownsville, Texas, to Nogales, Arizona, as revolution and disorder had broken out in Mexico, resulting in border violations and the killing of American citizens. In a functional redesignation of Air Service groups, the unit was redesignated as the 3rd Attack Group in 1921. It participated in maneuvers, tested new equipment, experimented with tactics, flew in aerial reviews, patrolled the United States–Mexico border (1929), and carried Airmail (1934) flying a wide variety of biplanes (DH-4, XB-1A, GA-1, A-3). On 1 March 1935, the Army Air Corps formed the first centralized control of its combat striking units within the United States under the General Headquarter Air Force. The 3rd Attack Group moved to Barksdale Field, Louisiana, as part of the 3rd Wing commanded by Col. Gerald Brant, together with the 20th Pursuit Group. Aircraft assigned to the 3rd Attack Group were the Curtiss A-12 Shrike in 1935 and the Northrup A-17/A-17A Nomad in 1937. The commander of the 3rd Attack Group, Lt. Col. Horace Meek Hickam, was killed on 5 November 1934, when the A-12 he was piloting (33–250) crashed while landing at Fort Crockett, Texas. Hickam Field was named in his honor. Some A-12s were still at Hickam Field on 7 December 1941, when the Japanese attacked, however, none of the aircraft saw any combat. The A-12 was withdrawn from service soon after. The A-17s were was fairly fast and had a fairly heavy forward-firing armament for its time, and during 1938–39 war games it was deemed to be the most effective ground attack aircraft yet devised. However the career of the A-17 with the Army was quite brief. After only three years of service with the Army, the A-17As were declared surplus. In 1940, the unit was redesignated as the 3rd Bombardment Group (Light), being reequipped with the Douglas B-18 Bolo and B-12 bombers and moved to Army Air Base, Savannah, Georgia. The 3rd Group served in combat in the Pacific Theater of Operations from 1 April 1942 until V-J Day. It was transferred to Australia early in 1942 as part of the United States Army Forces in Australia under Gen. George H. Brett and later the Fifth Air Force under Gen. George C. Kenney. On 2 April 1942, Lt. Col. John H. Davies was appointed to command the group, which had been shipped overseas under command of a first lieutenant and without aircraft. Davies had been in command of the 27th Bomb Group in the Philippines when war broke out, then had become stranded in Australia with 22 of his pilots after attempting to ferry the A-24 dive bombers being shipped to the 27th. These provided a leadership cadre and air crews for the 3rd Group. Their first aircraft acquired were 15 B-25 Mitchells, newly assembled but without crews, which had been shipped to Australia for the Royal Netherlands East Indies Army Air Force (ML-KNIL). With these the group conducted the first bombing mission ever flown by B-25s, sending six bombers to Gasmata, New Britain, on 6 April. Ten staged through Darwin to Mindanao on 10 April, flying two days of sorties against Cebu City and Davao on 12 and 13 April, before returning with passengers being evacuated from the Philippines. While officially designated the 3rd Bombardment Group (Light), the group unofficially styled itself with its historic name, the "3rd Attack Group," after being equipped with low-altitude strafing bombers. Field-modified with .50 caliber machine guns taken from wrecked fighters, these strafing bombers were the brainchild of a former naval aviator serving in the USAAF, Paul "Pappy" Gunn,The 13th and 90th Squadrons were equipped with its "Dutch" B-25s field modified into the B-25C-1 strafer configuration. The 89th Squadron flew the Douglas A-20A Havoc attack bomber while the 8th Squadron used the Douglas A-24 dive bomber until July 29, 1942, but also used the B-25 and A-20. The group had its headquarters in Australia until January 1943, but its squadrons operated from forward locations in New Guinea, bombing and strafing enemy airfields, supply lines, installations, and shipping as the Allies halted the Japanese drive toward Port Moresby and drove the enemy back from Buna to Lae. At the end of that campaign, group headquarters moved to New Guinea. For the next year and a half the group continued to serve in the Southwest Pacific, where it played an important role in the offensives in which the Allies pushed along the northern coast of New Guinea, taking Salamaua, Lae, Hollandia, Wakde, Biak, and Noemfoor. In March 1943 it took part in the Battle of the Bismarck Sea, which ended Japanese attempts to send convoys to Lae. In August 1943, when Fifth Air Force struck airfields at Wewak to neutralize Japanese airpower that threatened the advance of Allied forces in New Guinea, the group made an attack in the face of intense antiaircraft fire on 17 August, destroyed or damaged many enemy planes, and won a Distinguished Unit Citation for the mission. In the fall of 1943 the group struck Japanese naval and air power at Rabaul to support the assaults on Bougainville and New Britain. In an attack on shipping at Simpson Harbor, New Britain, on 2 November 1943, the 3rd Group encountered heavy opposition from enemy fighters and from antiaircraft batteries on the ships. In that attack Major Raymond H. Wilkins, commander of the 8th Squadron, sank two ships before he was shot down as he deliberately drew the fire of a destroyer so that other planes of his squadron could withdraw safely – an action for which Maj Wilkins was posthumously awarded the Medal of Honor. The group moved to the Philippines late in 1944. Equipped with A-20s, it bombed and strafed airfields; supported ground forces on Mindoro, Luzon, and Mindanao; attacked industries and railways on Formosa; and struck shipping along the China coast. The group moved to Okinawa early in August 1945 and flew some missions to Japan before the war ended. Moved to Japan in September 1945 and, as part of U.S. Far East Air Forces, became part of the army of occupation. 3rd Bomb Wing B-26B-50-DL Invaders during the Korean War. Serial 44-34306 identifiable. Flying Douglas A-26 Invaders (after 1948, the B-26) the 3rd Wing participated from the first bombing sortie to the very last during the Korean War. The first Americans to lose their lives during the Korean War, 1Lt. Remer L. Harding and SSgt. William Goodwin, were assigned to the 13th Bombardment Squadron when they lost their lives 28 June 1950 returning from a sortie on the Korean Peninsula. Captain John S. Walmsley, Jr. was posthumously awarded the Medal of Honor for his actions on 14 September 1951: flying a night mission in a B-26, Capt Walmsley discovered and attacked an enemy supply train, and after exhausting his ammunition he flew at low altitude to direct other aircraft to the same objective; the train was destroyed but Walmsley's plane crashed in the target area. In recognition of the wing's distinguished service, the 3rd Bombardment Wing's was granted the privilege of conducting the last bombing mission over North Korea minutes before implementation of the ceasefire of 27 July 1953. With the war over in Korea, wing returned to the routine of peacetime duty in the Cold War environment. 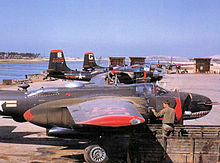 It remained at Kunsan Air Base until October 1954, when it moved to Johnson Air Base, Japan. Beginning in January 1956, the 3rd Bombardment Group converted from the B-26 to the Martin B-57B Canberra Night Intruder. By August 1956, the Group had become a paper unit, with only one officer and one airman assigned for record purposes. Its squadrons were attached to the 3rd Bombardment Wing, which had assumed its duties. On 25 October 1957, those squadrons were transferred to the wing and the group inactivated. In 1991, activated in Alaska after 34 years on the inactive list, and expanded the air defense mission of the 3rd Wing, to include deep interdiction and air-to-air capabilities with the F-15E aircraft. Added an airlift capability in April 1992, using C-130 and C-12 aircraft, providing worldwide combat airdrop, tactical airland, operational support airlift, airlift for theater deployed forces, and resupply of remote Alaskan long-range radar sites. Again expanded its mission in 1993 when it gained E-3B/J aircraft for long-range airborne surveillance, detection, identification, and command and control. Since 1993, mobilized, deployed and employed flying squadrons worldwide to accomplish air superiority, air battle management, air interdiction, counter narcotics, airlift and air sovereignty in support of 3 Wing mission. ^ The group uses the 3rd Wing emblem with the group designation on the scroll. ^ The 8th Aero Squadron was organized on 21 June 1917; the 13th on 14 June 1917, and the 90th on 20 August 1917 by the Aviation Section, U.S. Signal Corps. These squadrons served in combat during World War I prior to their assignment to the 3rd. ^ The four squadrons assigned to the Army Surveillance Group (8th, 12th 13th and 90th) upon the group's activation all predate the formation of the group; having been formed in 1917 as a result of the United States' entry into World War I. All were deployed to France and fought on the Western Front; their combat being reflected in the group's emblem. ^ a b c d e f g h Robertson, Patsy (February 6, 2015). "Factsheet 3 Operations Group (PACAF)". Air Force Historical Research Agency. Archived from the original on June 4, 2016. Retrieved May 10, 2016. Cortesi, Lawrence (1985). Grim Reapers: History of the 3rd Bomb Group, 1918–1965. Temple City, CA: Historical Aviation Album. ISBN 978-0-91185-294-3. Martin, Adrian R.; Stephenson, Larry W. (2008). Operation Plum: The Ill-Fated 27th Bombardment Group and the Fight for the Western Pacific. College Station, TX: Texas A & M University Press. ISBN 978-1-60344-019-6. This page was last edited on 17 March 2019, at 08:03 (UTC).